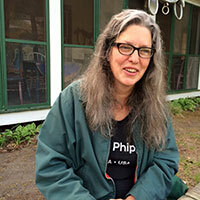 An interview by Steve Miller with book maker and bookbinder Martha Kearsley. She is the proprietor of Strong Arm Bindery in Portland, Maine, and taught a class entitled Field and Sketch Books at Paper and Book Intensive. Music is La Luna from Bedroom Databank Vol.2 by Atlas Sound.